Among both professionals and amateurs in the world of composites, there are certain enduring misconceptions and rumors regarding the effects of elevated temperature on an epoxy bond. Armed with just enough misinformation to be dangerous, folks will make important decisions that can lead to costly or time-consuming mistakes that might have been avoided if they had an adequate understanding of the principles that encompass epoxy structures and temperature. By defining some commonly used terms and briefly discussing issues surrounding application, we hope to dispel some of these misconceptions. The most commonly used and misunderstood term is heat deflection under load (HDUL), often shortened to simply the heat deflection temperature (HDT). This shortened name helps to breed some of the confusion. HDUL is a standard test (ASTM D-648) used industry- wide to characterize the thermal behavior of a resin system. 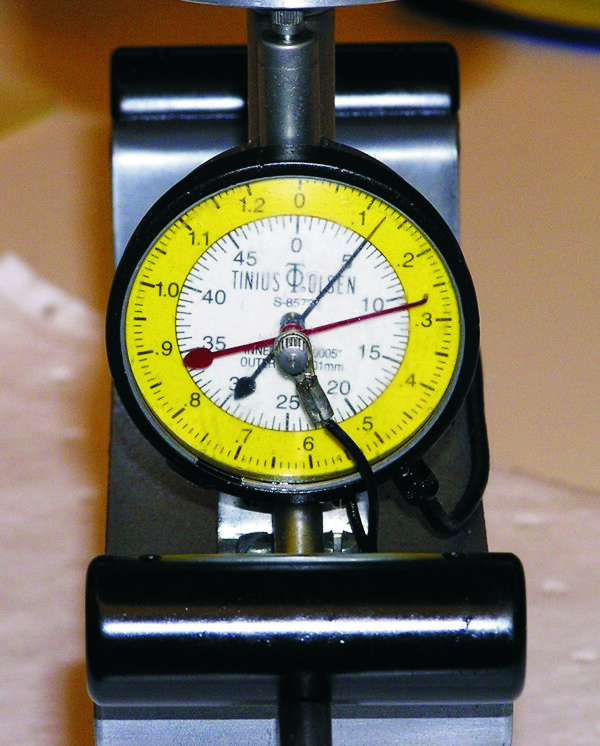 The test determines the temperature at which a bar or coupon of cured epoxy (without reinforcing fibers) 1 8″ thick× ½” wide × 5″ long and under a point load of 264 psi will deflect 0.1″ (~7 64″). The test sample is loaded in the test apparatus and simply supported at both ends, on edge, and the load is applied in the center—a typical three-point bend test (Photos 1 & 2). 1. 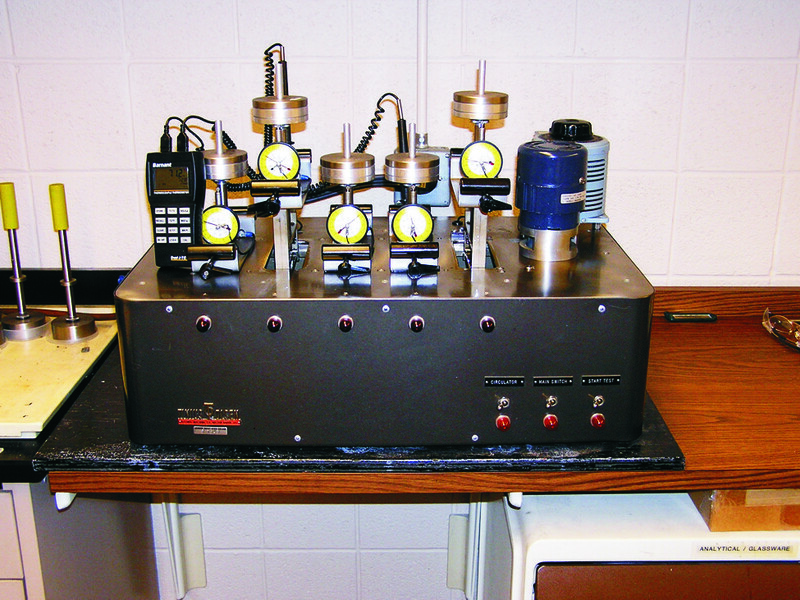 The test apparatus hold five of the test samples shown below in a bath of heated oil while a three-point load is applied to the sample. 2. This shows how the load is applied to the coupon of epoxy. the coupon is still solid but has bent, illustrating the concerns regarding creep. Then the sample is lowered into an oil bath that heats slowly up from room temperature and stops when the sample deflects the 0.1″ (Photo 3). 3. 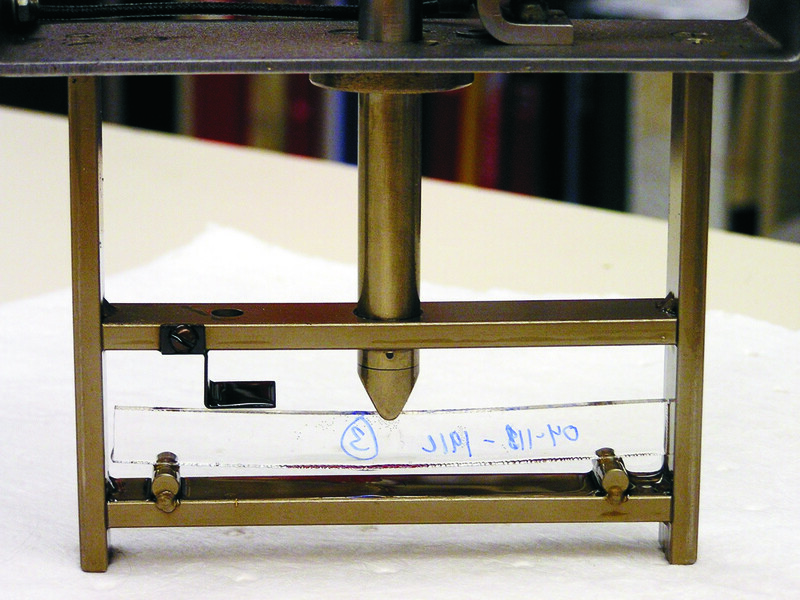 A gauge measures the deflection of the epoxy sample as the temperature of the oil bath increases. The misconceptions are that above this temperature the epoxy no longer has any structural integrity, adhesive strength, and/or that it even begins to return to a liquid state! None of these correctly characterizes what is happening. With an understanding of how HDUL is measured, it should seem obvious that the epoxy becomes more flexible as the temperature rises above room temperature (typically 72°F), but the epoxy is still quite strong. Although it is true that there are epoxy systems on the market formulated to have an HDUL lower than room temperature, these epoxies are for specific, non-structural applications. Here’s an example which demonstrates that epoxy retains its structural integrity and adhesive strength after exposure to high temperatures. We have glued two blocks of mahogany together with WEST SYSTEM® epoxy, allowed it to cure for one week at room temperature, and then exposed the whole assembly to 200°F for 3 hours before forcing a chisel into the glue line to fail the joint. When the joint was examined closely, we found that the primary failure was in the wood and not the epoxy. Experience has also shown that while heat tends to soften epoxy while it remains warm, if WEST SYSTEM epoxy is not exposed to damaging heat (exceeding 230°F for extended periods), it will return to full strength when cooled to room temperature. What this test does not reveal is the behavior of a loaded or pre-stressed bond line. Joints of this nature are subject to static or constant loads, often referred to as creep loads. When epoxy is used for building projects, this aspect of the design and engineering must be considered.1 The anticipated load and working temperature of the joint may indicate that additional techniques be applied to ensure the long-term viability of the joint. Such techniques can include using mechanical fasteners, increasing the surface area of the bond, increasing the thickness of a composite laminate, or incorporating more thin laminations in a curved wood laminate so each lamination has less stored energy. All of these reduce the effect of creep loading in a joint or lamination. A more ambiguous term that is often misunderstood by the end user is the glass transition temperature (Tg). This term is also reported differently by various resin manufacturers, which adds to the confusion. The glass transition temperature can be measured by various methods, such as a Differential Scanning Calorimeter (DSC), Dynamic Mechanical Analysis (DMA), a torsion pendulum, the dielectric constant, volumetric methods, and even “bouncy balls”. Since the value of Tg depends on the strain rate and the heating/cooling rate, there cannot be a single, exact value for Tg. Resin manufacturers use different methods and different reporting criteria for Tg, which leads to inconsistencies when comparing data from multiple sources. Each of these methods serves to define a point at which cured epoxy, which is an infusible solid, becomes a rubbery solid. A good way to visualize this is to think of a rubber garden hose left out in the winter versus the same hose in the summer. In the winter it’s hard and stiff, in the summer it’s soft and flexible— but either way, it’s still a garden hose. We believe the temperature that a manufacturer reports in the product literature for glass transition should be within a few degrees of the HDUL temperature for the design and engineering reasons outlined above. However, often times the Tg is significantly higher. The reason for the discrepancy lies in how the test is performed and subsequently reported. We measure Tg by DSC, which conforms to ASTM standard D-3418, and choose to report the onset of the transition. This results in a value close to the HDUL. It is also legitimate to report the midpoint or endpoint—as long as you disclose how Tg was determined. Here’s how it works: A small sample of cured epoxy is placed in a small aluminum crucible about ¼” in diameter and placed in the DSC machine next to an identical, but empty, crucible. This is the ‘differential’ aspect of the test. The test chamber is a small oven that can measure and record the differences in heat output and/or uptake between the two crucibles. The oven then runs through a heating cycle from 30°C (86°F) to 200°C (392°F) at 10°C/min and the minute differences in the heat output/input are recorded by the machine’s sensors. After this heating is finished, the oven cools and the heating cycle is repeated; however, for this run, the epoxy sample has been effectively post-cured by the initial heat cycle. As a result, the glass transition temperature will nearly always be significantly higher. In fact, ASTM D-3418 can be interpreted to require the measurement of Tg from this second heat cycle to “erase thermal history.” From a formulator’s point of view, this data is useful; from a builder’s point of view, it is not practical. A close look at a WEST SYSTEM Technical Data Sheet shows that we report the “onset of Tg” measured from the first heat cycle, as well as the “ultimate Tg”, which is from the second heat cycle. We believe onset of Tg is the most useful value to report because it’s not practical for anyone to post cure their project to 392°F and, in fact, epoxy can be damaged by exposure to this high a temperature. Now, this may be hard to accept, (especially during this political season where honesty is valued at such a premium), but some manufacturers report the ultimate value and don’t bother to tell their customers! I know, I know, it’s shocking—but business can be brutal. Regardless, the practical implications from the Tg information are the same as discussed for the HDUL. To summarize, keep in mind the meaning of the terms and test methods discussed in this article. HDUL means heat deflection under load and it’s of key importance to remember this element of the test when someone refers to it as heat deflection temperature and wants to argue that the epoxy will fail at this temperature. A 264 psi load is quite a significant load. So if a joint or bond line is not loaded to a similar level, or is in fact not loaded at all, the likelihood is that neither the epoxy nor the joint will fail. Similarly, the glass transition temperature, or Tg, if reported honestly, defines the point where the epoxy begins a transformation to a rubbery solid. Most importantly, neither term defines a temperature above which epoxy cannot be used. Still, if your joint will live in a working environment at or near the HDUL or Tg temperature, then you should consider the nature of the joint within the structure to decide if epoxy alone is sufficient or if other techniques are called for. If you have questions, our technical staff is available Monday through Friday 8:00 a.m. to 5:00 p.m. EST by calling 866-937-8797 toll free. 1 “Designing for Rigidity and Strength under Static Load” in Modern Plastics Encyclopedia 1986-87, p. 403 for a detailed discussion. This entry was posted in Materials Testing, Techniques & Tips and tagged 23, Bruce Niederer, Epoxyworks #23, Spring 2006 on January 22, 2015 by ewadmin.